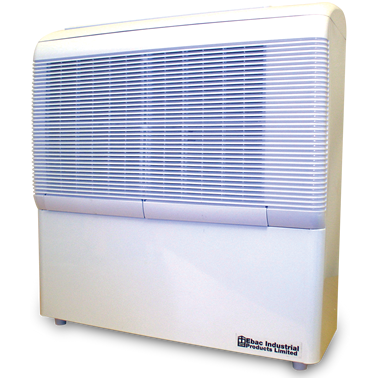 The EIPL AD850E dehumidifier is an ideal solution for humidity control in a wide variety of applications including offices, apartments, stores, restaurants, bars, salons, museums, storerooms, computer and telecommunications rooms, garages, cellars and animal enclosures. Its also great for spa rooms in homes or hotels / motels. The effective answer to excessive humidity is a dehumidifier. Rated at 50 decibels, the AD850E is quiet enough to have in your home, yet strong enough to combat adverse moisture problems. The AD850E is a high capacity dehumidifier made to operate at high efficiencies by removing moisture from the air through the refrigeration process. The fan draws the moist air through the cold evaporator coil, which cools the air below its dew point. Moisture forms on the evaporator coil and is collected in the condensate tray, which is equipped with an internal condensate pump for easy removal of collected moisture. The cooled air then passes through the hot condenser coil where it is reheated using the same energy removed during the cooling phase, plus the additional heat generated by the compressor. The air is, therefore, discharged from the AD850E at a slightly higher temperature with a lower absolute humidity than that which entered. Continuous circulation of air through the AD850E gradually reduces the relative humidity within the area. Because the AD850E is equipped with an internal humidistat, it automatically switches on and off to save energy and expense by maintaining the desired level of humidity with intermittent operation.